WHEN he was 11 years old his father killed himself at home following a series of personal setbacks. Nick McKendrick’s family was reluctant to even talk about what happened – and to this day he doesn’t know if his dad left a note. Every child, young person, and family should have the opportunity to grieve, come to terms with, and begin to rebuild their lives after the loss of an important person. 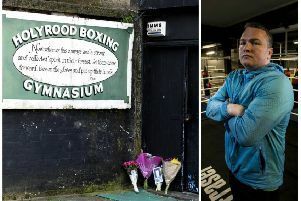 And now – almost two decades after the tragedy – he will run his first Edinburgh Marathon at the end of the month in memory of his father to open up a discussion about the taboo. He will be raising up to £1000 to be split between leading childhood bereavement charity Winston’s Wish and Survivors of Bereavement by Suicide. Speaking on the 17th anniversary of his father’s death, the 28-year-old from Gorebridge said: “My hope is that by generating a greater awareness of these charities and their fantastic work, and by sharing my own story we will become more open to discussion about suicide and with survivors of suicide, which is still seen largely as a taboo subject. Ian Duncan McKendrick took his own life in 1999 at the age of 43 in a home he was renting in Skegness. He was never diagnosed with depression but Nick suspects the downward spiral began following the breakdown of his marriage. The split led to him “slowly losing touch” with Nick and his older brother James. He also embarked upon another relationship which didn’t work out and may have fallen on hard times financially. Described as a “creative” man by his son, he had been a compositor for the printing trade in Lincolnshire. But towards the end of his life he was working as a gardener and may have been taking odd jobs to make ends meet. Nick, who recalled feeling “stunned and numb” following news of his father’s death, said: “I was away at boarding school when he died so I was quite removed from a lot of the goings on. My parents were divorced at the time of my father’s death. “His mental health was poor at the time and I had limited contact with him. I buried my head in the sand and turned my back on it. And my family’s response to his death has been largely not to speak about it. • The Samaritans provides a safe place for people to talk and are available 24 hours a day. Contact the helpline on 116 123 or online at www.samaritans.org.